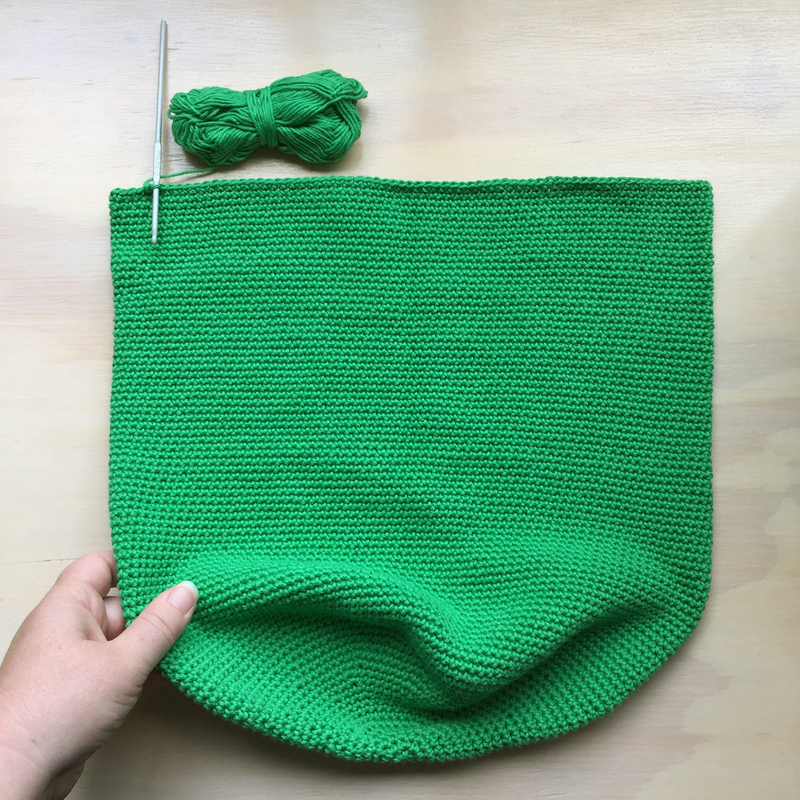 I finished the Green Bag! It's a very simple project, but there were a lot of those little crochet stitches in there so it took me quite some time to do. You may have seen some of these photos on the blog before, but I find it useful in a wrap up of a project to have all the pics for that project in the post. For those who may find it useful, I'll give a basic how to. This isn't a pattern, and I didn't follow a pattern myself, so there was a bit of frogging here and there when I realised I was going too big. You may learn from my mistakes and use this as a starting point for your own crochet bag project. There are some things I'd like to try a different way next time. The yarn I used was Paintbox Cotton DK. 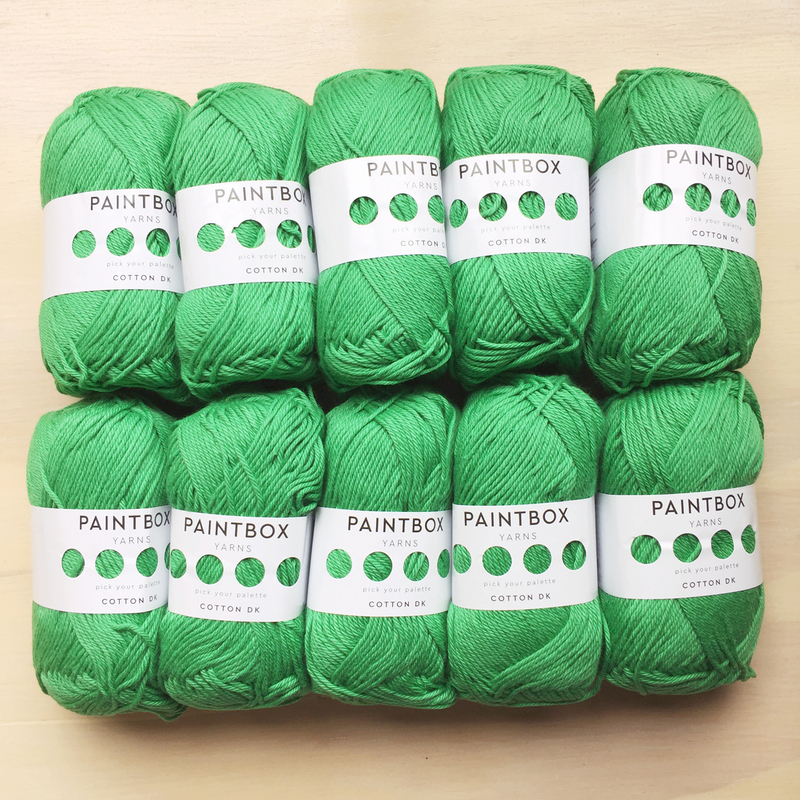 So many gorgeous colours to choose from in this yarn. It had the right texture that I wanted as well. Not shiny, not fluffy, sturdy without being coarse or rough. The resulting fabric is lovely, soft, drapey and stretchy, perhaps even a little too stretchy for a bag. I haven't loaded this bag up because I can see it will stretch with a load in it, and there's no reinforcing around the top, so it will stretch away from the handles. I'm ok with this, it will age nicely I think, but I will keep it as a project bag, or for those days when I only need to carry the basics with me. I used approximately 4.5 balls for this bag. I went down in hook size to get a tighter denser effect. The yarn recommended a 4mm hook and I used a 3.5mm. 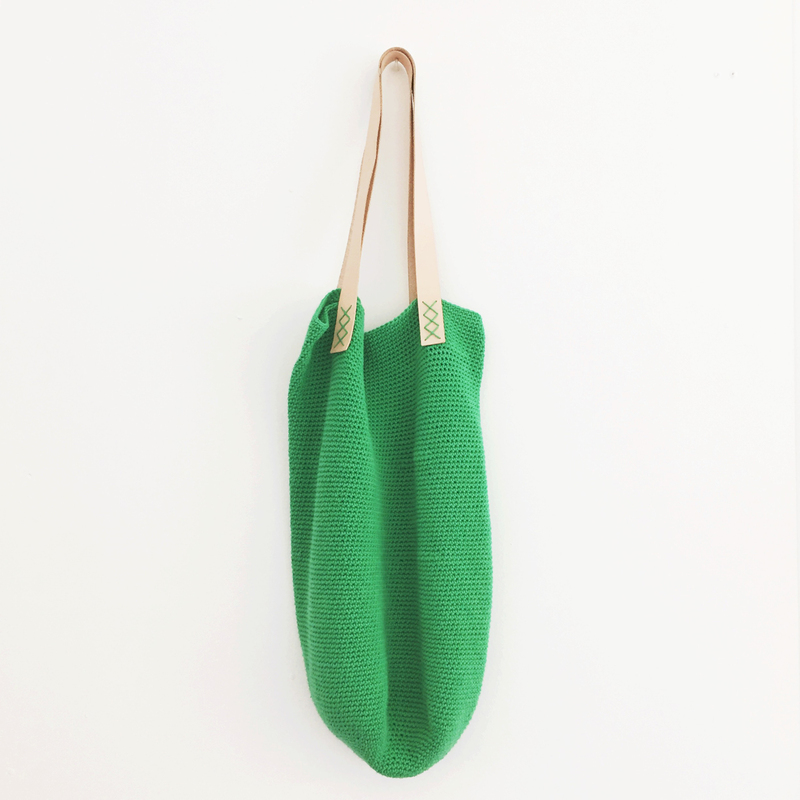 This bag is a cylinder shape, done completely using single crochet (US)/double crochet (UK). I crocheted a flat circular base and then continued with straight sides until I'd reached the desired length. At this point, I would consider next time actually creating a hemisphere shape for the base. I'm not sure how to do that yet, but I see a lot of spherical forms in amigurumi so I'd go look at some of those sorts of patterns for tips. For the base I used Shelley Husband's guide to crocheting flat circles. I must admit I only kept a very vague eye on the start and end of rounds, essentially keeping the two tricks for keeping the circle flat in mind and going on from there. You could actually mark the beginning of your rounds and keep count of your stitches, I wish I'd had the patience! It was about this point I realised that I had made too big a circle. Three balls in and I had such a wide bag I could see it wouldn't get very tall with just two more balls. I had budgeted 5 balls for this project and I was determined to stick to it! A good idea is to measure the circumference of another tote bag you may have as a reference point. Do not measure the flat width of a tote bag and use that as your diameter. It will be too big. Circumference equals pie (about 3.14) times diameter. So get your fave sized tote bag, measure the circumference (or measure the flat width and times it by 2), then divide that by 3.14. That is what the diameter of your base circle should be. After frogging, I used less than a ball for the base, the diameter of my bag base is approximately 23cm or 9". 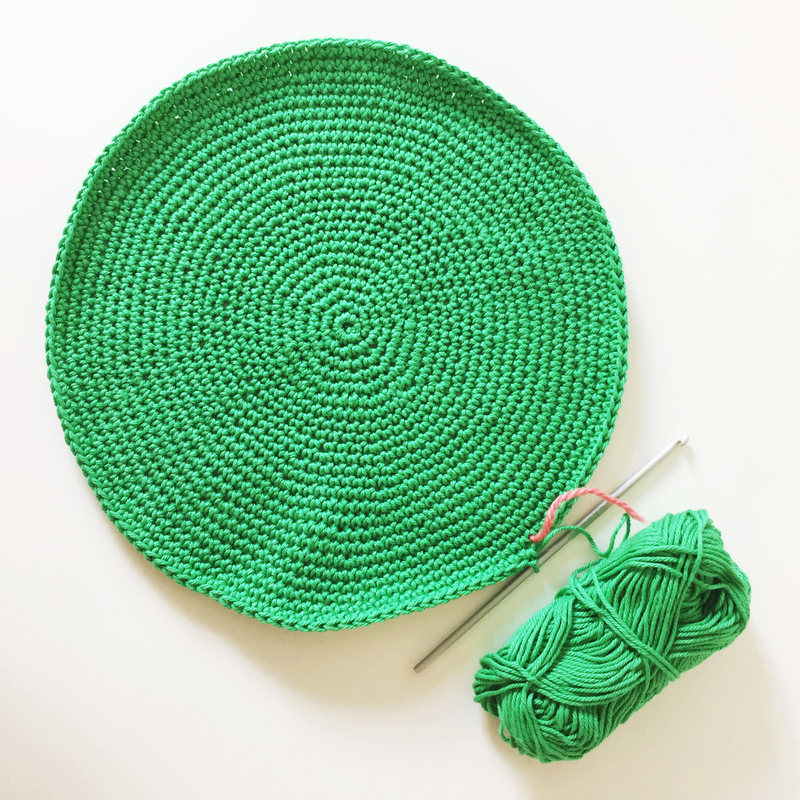 Once you have reached your preferred diameter, no more increasing is needed, you just keep crocheting using single crochet (US)/double crochet (UK) round and round until the bag reaches the length you desire, and finish it off, being sure to weave that end in really well. Leave at least 20cm or about 8" for weaving in that end! The base of the bag will add to the overall length as it drapes down. If you leave a marker in for where you finish your last round of increasing for the base, you will be able to measure the sides fairly well. The sides of my bag are about 38cm or 15" long. I dithered about those handles for some time. The resulting fabric was so soft and drapey I didn't want something too stiff that would be at odds to the crocheted part of the bag. I almost went for a cotton webbing, which I think could also look really good depending on how it was finished, and the thickness of the webbing. 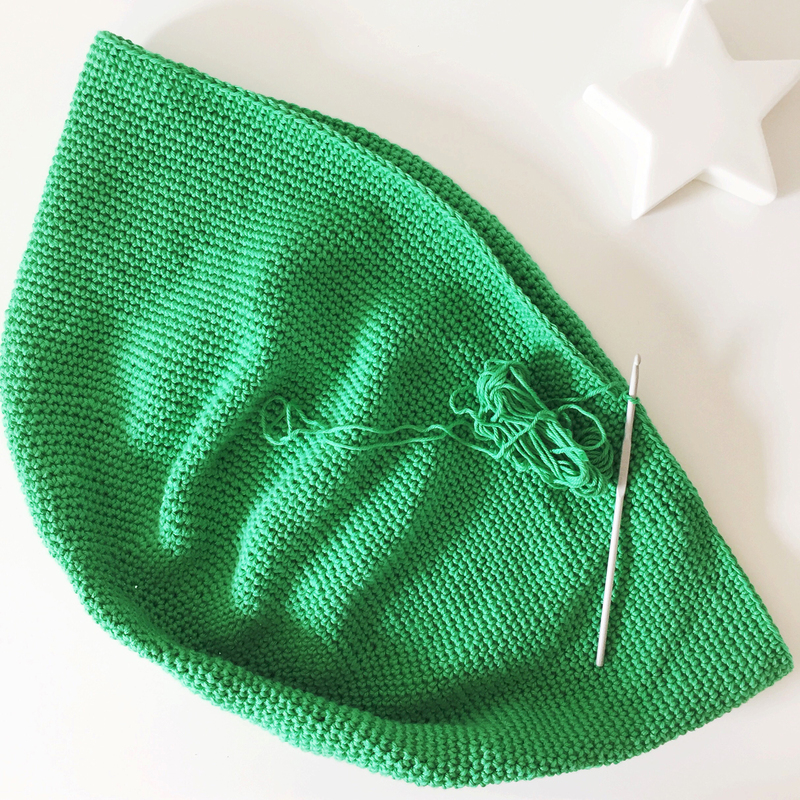 You could crochet the handles in as part of the overall design, that wouldn't be an unusual feature of crocheted bags, or crochet the parts separately and sew them on. I ended up going with leather. After looking around online I decided to try to find a local leather worker so I could see the leather for myself first. My handles are 70cm or about 27.5" long. They overlap the bag 6.5cm or 2.25". They are 2.5cm or 1" wide. If you choose to use the leather handle option, you may wish to get the holes pre-punched for stitching to the bag. My handles are quite thin, being only 1.5mm thick leather, and I was able to make the holes easily myself after measuring up the stitch design and marking the locations. When sewing the handles on, weather you use the cotton you crocheted the bag with or some other thread, ensure you weave in your beginning end thoroughly and firmly, and pull your stitches firmly through, weaving into the fabric each time you go through to the reverse side between stitches. Make sure the handle is held firmly against the fabric and that it can't be lifted up at all through the process. As you can see I have only gone through with the yarn once, I'm considering going through and stitching a second time, although it is all sewn and woven in firmly. Let's face it, I'm not going to be putting a house brick in this bag and swinging it around my head. I've got some other ideas about the handles for this bag that are a bit more elaborate, I'll need to have a think about it. Something else you may want to consider is doubling over a section at the top of the bag to stiffen the top edge. It'd give it quite a different look, but it could be done by just folding over about 7.5cm or 3" of the top and then using something like slip stitches to join the edge to the inside of the bag. Then attach the handles to a double-up fabric, which would make everything stronger. 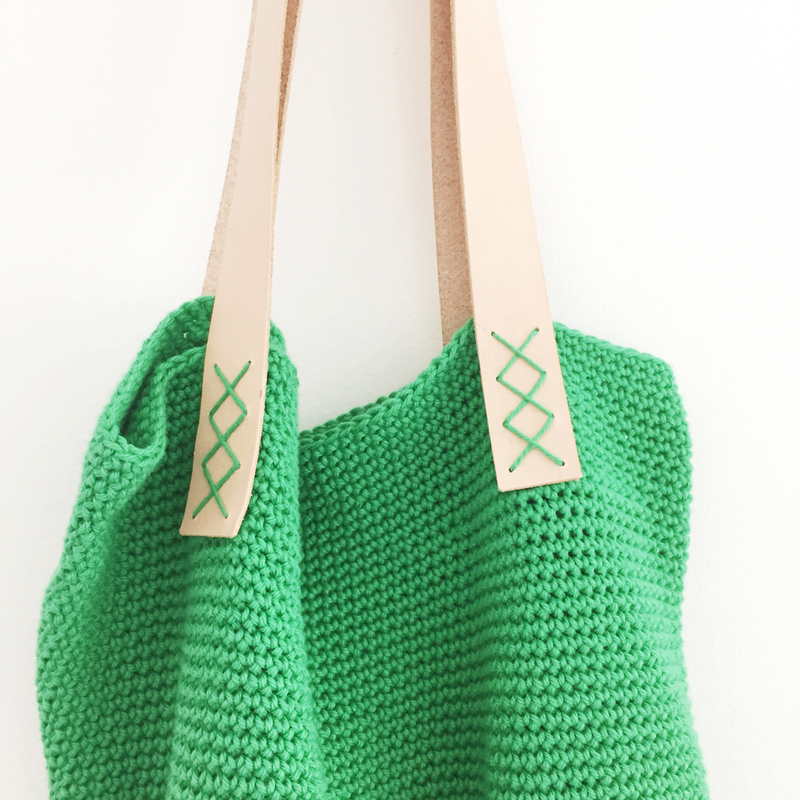 I hope you enjoyed this not-a-pattern-at-all ramble on how I made my bag, and perhaps find it useful or perhaps inspiring in creating your own! P.s - I couldn't do this post any sooner, the last couple of days have been way too hot to work in my office. But today is glorious! 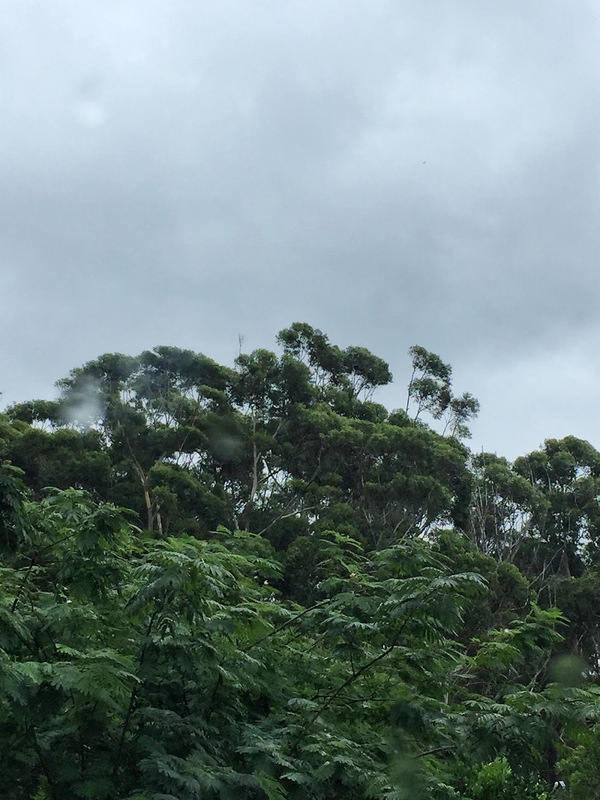 It is grey and wet and windy and I love it. This is the view from my office today. Perfection. I love this bag. The green is perfect (Michelle and I often have discussions about the perfect green. I love all shades of green but the one she used is the one we have previously agreed is 'perfect green') The stitches holding on the handle are so precise and such a nice detail. In short, I love this bag and am really very envious. Well done Michelle. It looks great!